Now that I had the shirts I had to start doing some research on how to make the quilt. After about an hour of research I discovered a tutorial by Mandy of Dixie Chicken Quilts that provides clear step by step instructions to making a t-shirt quilt. By the way this photo is the inspiration photo for me that my cousin sent me. The quilt below is for a female so I am aiming for a quilt similar this this style but obviously for a male. 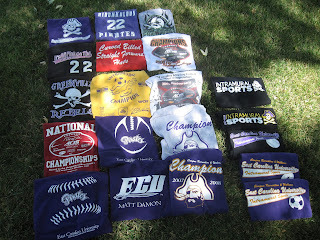 I'll be posting every step of this t-shirt quilt process so come back to cheer me on. If you have made a t-shirt quilt and have any advice, please feel free to share it. 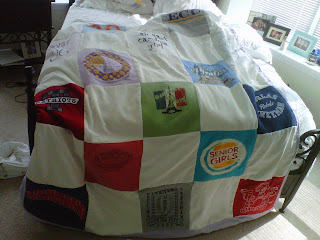 My goal is to be standing in line at the post office on Monday, August 29th to send this quilt off to Annapolis. Wish me luck! Hey Susan, you're a brave woman. 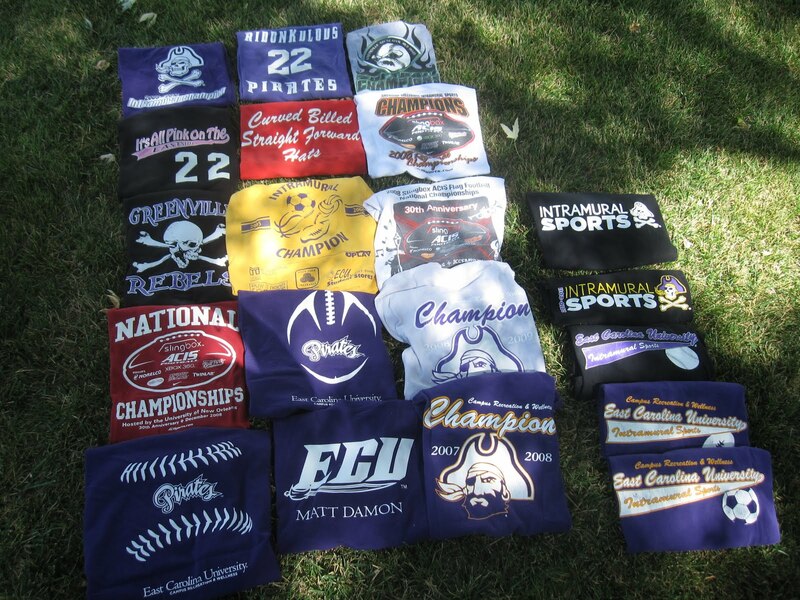 I have quilted at least ten t-shirt quilts in my business. I would recommend a batting with a scrim to help stabilize the top (such as Warm & Natural/White), and would avoid flannel on the back. Stretching will be the main challenge once the quilt is finished - quilting can pop right out. The quilts I've quilted all had a sashing of woven fabric in between, and those were quilted, as well as an outline of the logos on the shirts. Good luck! wow - that IS a challenge! I've heard stabilizing is a must & I see the tute suggests fusible interfacing, so I think you're on the right track. I'll be encouraging you along!!! You.Can.Do.It! Rah!